Namibia, situated in southwestern Africa, obtained their independence in 1990. It is one of the youngest republics of the planet. A little over 2 million people live in the great territorial extension of the country, making it the second least densely populated nation in the world. 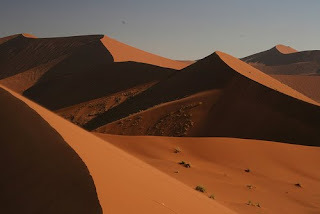 Namibia has a large variety of ecosystems, the Namib and Kalahari Deserts cover a considerable portion of the nation. Tourism, agriculture and mining are the back bone of the country's economy. At the world's greatest beauty contest, Namibia debuted in 1989. Two of their delegates placed in the semifinals in 1991 and 2006. The highest placement was Michelle McLean who finished as 4th runner-up in 1991. This year, Namibia will be represented in Miss World 2010 by Odile Madeline Gertze who won the Miss Namibia 2010 contest last July. 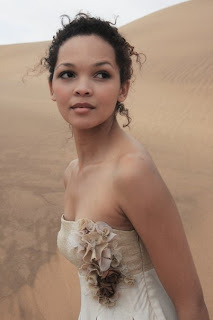 TimesOfBeauty.com proudly presents Miss Namibia 2010 in an exclusive interview for our series Meet the Misses. Hi there, my name is Odile Gertze, 22 years old and I am a proud Namibian girl, born in the capital – Windhoek. I am passionate about life, art, nature and my country. I currently work as a model booker, model and freelance fashion journalist. Before, I studied fashion design as I enjoy creating clothing and the artistic challenges that come with it. I always say, if it’s not a challenge, then I’m not interested :). I love dancing, where I am qualified in ballet, contemporary and ballroom. I also enjoy reading, theatre and game drives. I tend to act a little silly but only because I enjoy laughing. I strive to stay positive and enjoy every day to the fullest. Namibia, situated on the southwestern coast of Africa, is home to 2.1 million in population. Namibians are warm people, and although we have our flaws, we strive to offer exceptional hospitality. My country is a place of wide open spaces, possesses the oldest desert in the world along with the highest dunes which can be found in Sossusvlei, the 2nd largest canyon in the world (Fish River Canyon), the big five, 13 ethnic groups and breathtaking sunsets to name a few. Although I was born in Windhoek, my favorite place in Namibia is Ai Ais Hot Springs, the new jewel of NWR (Namibian Wildlife Resort). This area is spectacular with so much explore because you feel as if no one else has ever been there. It is also the place of ‘Hot Water’, where you can find great relaxation in their hot springs. Definitely a place to put on your tourism list! I feel really honoured to represent Namibia, as this is a beautiful blessing from above to be an ambassador for my country in the 60th Miss World pageant – which is a once in a life time opportunity. Since I was only crowned on the 31st of July, I am still trying to find my feet in my new life. So far, I have been involved with numerous charitable causes, dance rehearsals, fittings, photo shoots and reading up on national and international news. Determined. I strive to be the best, bring out the best in everyone and enjoy the rewards of a job well done. I would like the charities that I begin during my reign as Miss Namibia to be successful by creating a positive driving force to the people of Namibia and the world. On a personal note, I would like to be married with children, my own fashion line ranging in clothes, shoes, accessories and fragrances. If my fashion line should not succeed. I would then like to pursue a career in fashion publication. Or Both! Poor and smart, because wisdom is more precious than silver and gold. Minister of Justice, Honorable Pendukeni Iivula-Ithana and Patron for the Miss Namibia 2010. She is an incredible inspiration to Namibian women as she was part of the struggle for independence since 1974. Her persistence and drive to succeed for our country makes her a worthy role model. Milan. It is a great fashion and art destination. HIV/AIDS. This epidemic has hit southern Africa harder than any part of the world. 33.4 million carry the disease and 2 million of the world’s population die from AIDS every year. Even though organizations have done their best to create awareness, they have been successful in decreasing statistics considering the limited resources available, esp. in Namibia. However, I personally feel, it will be more affective to involve people who are HIV positive. I know the more that are involved with better knowledge; the more improvement will be made. The way we view situations depends on our perceptions. There is nothing wrong with a personal view as long as you do not have the motive or intention to offend. Interaction and forming of new friendships between the finalists, the experience of a completely new and different culture of China and the life lessons I will learn on this incredible journey. Miss World 2001, Agbani Darego from Nigeria. Even though she had a difficult history (was born into a family of eight, mother died of breast cancer, and father was against her career choices) she did not allow her setbacks to stop her from following her dreams. I admire her persistence. To use your talents to bring charity to the less-privileged; to promote deserving social causes; to serve as an example of purposeful living by the young and to bring honour and pride to her Nation as a representative and ambassador of goodwill. Conny Maritz, national director of Miss World in Namibia.